Silver Arrow Knits! : I Want That Shirt (Because I Already Have The Swift)! I Want That Shirt (Because I Already Have The Swift)! The knitting has been slow with the upcoming exams and presentations; however, that doesn't mean that I haven't been paying attention to knitting references around me. 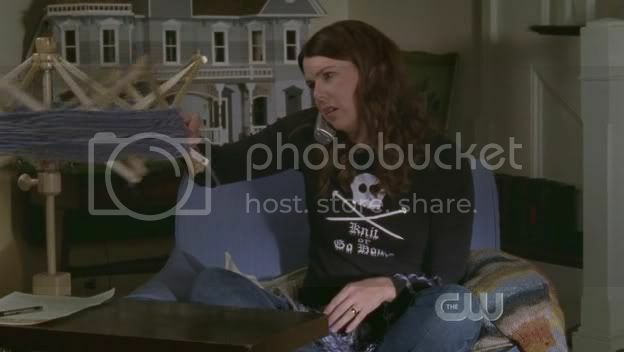 Did you check out the Gilmore Girls this past Tuesday? 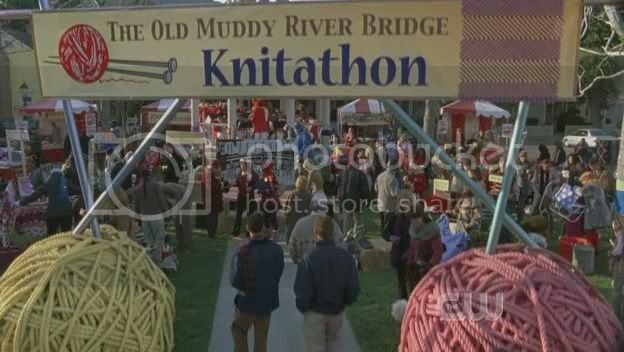 Well, there was a Knitathon! Here is a picture of Lorelai winding yarn (her shirt says...I think...Knit or Go Home) and the totally awesome yarn and needles display at the Knitathon.